1988; 260 pages. Book #5 in the Discworld series. Genres : Fantasy; spoof. Overall Rating : B+. The 8th son of an 8th son of an 8th son always turns out to be a sourceror. And from a sourceror, magic just spontaneously gushes. Which causes massive upheavals in Discworld. Wizards change from stumblebums to conquering tyrants. Mage wars begin. The end of the (Disc)world is nigh, and the 4 Horsemen of the Apocralypse ride forth. Well, okay. One horseman and three pedestrians. a genie in a lamp - with a serious attitude problem. The drawbacks are slight. At only 260-pages, it's a bit short. Although there is some character development (most notably Rincewind and The Luggage), there really isn't much depth of character. This was kind of a "transition" book for Pratchett- the tone is just a tad bit more serious than his earlier works, and the book loosely examines the themes of Power, Ambition, and Self-Sacrifice. With time, Pratchett's Discworld books get longer, a smidgen less zany, and a dab more insightful as his writing style evolves. "I meant," said Ipslore bitterly, "what is there in this world that makes living worthwhile?" I love that end dialog! I really need to read another Pratchett book. This one sounds fun. I love that end dialog too! I don't know a lot about these books and I noticed that this is book #5. So, I was wondering if you need to read all of them in sequence to understand each book better or could you say start at #5 and go back if you decide to read them all? Amanda - among Discworld fanatics, Sourcery seems to be a "so-so" book. i'm not sure why. Julie - other than the first two (The Colour of Magic and The Light Fantastic), all the rest are stand-alone stories. i'm not reading them in order, and i don't think it's a drawback. Ugh, cats! I so have a problem with Death now. I knew there was a reason I like Death! Aw man, that takes me back. 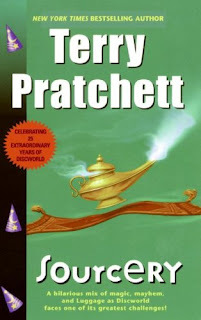 I don't think I could ever think of Sourcery as an 'so-so book' hamilcar barca, for me it marked the point where I was fully engrossed in the Discworld - the point of no return - many years ago. Perhaps if I were just reading it now for the first time I might feel differently though? Discworld Mal - i liked Sourcery and gave it a B+. my "so-so" remark is based on what self-proclaimed "Discworld fanatics" wrote at Amazon. com.